Robyn Vilate: Sira & Mara Giveaway! sooo excited to announce this amazing giveaway from sira & mara! assuming you all have been following me for over a week, you've definitely seen this amazing necklace that i've loved styling in these posts! sira & mara is a fabulous online jewelry company and they will be giving away this lovely turquoise necklace that you see above to one of my lucky readers! 4. comment below letting me know you've done all these things and wait to see if you've won! make sure you enter by saturday night - the winner will be announced this sunday! also, make sure to check out sira & mara's website at siramara.com to see all of their other amazing jewelry! What a beautiful and expressive necklace. I have followed and liked all the the IG's and Facebooks listed above. Fingers crossed ! i love this necklace and the way you've styled it. i follow your blog and i follow you on instagram! Done! :) I lovvee lovvee lovee that necklace! So beautiful! And I adore your blog! Love your style! I have eyed this necklace ever since you first posted it. It seems to go with everything I love it. I have followed and liked all :)! So cute!! I follow your blog & insta and now I follow sira & mara! Hope I win!! Thanks for the giveaway! done done and done. I even started pinning this blog because the design and content are pretty dope. I LOVE this necklace. It reminds me of the island I grew up on and the outfit your paired it with in the orange cover up, I think is super me. Crossing my fingers and my toes until Sunday! Such a fabulous necklace! I'm a follower! Done and Done! Turquoise is my favorite-so excited! Oh that necklace is SO CUTE! I want it. I did everything. Love the necklace... I did everything to enter... fingers crossed! I like Cleverly Yours and Sira & Mara on fb. (io sophia). Love this piece, so versitile! I've been in love with this piece for weeks! Did it all! Love your blog, you are gorgeous! And would love to win that necklace! This necklace is gorgeous! I follow your blog, both instagrams and liked both facebook pages. Hope I win! Don't have a FB.... :/ but still a fan! Would love to win! I follow both IG's and liked both FB's as well as follow your blog. Hope I win! Alright I have followed everything! And turquoise is my favorite color!!! Done all of the steps!! 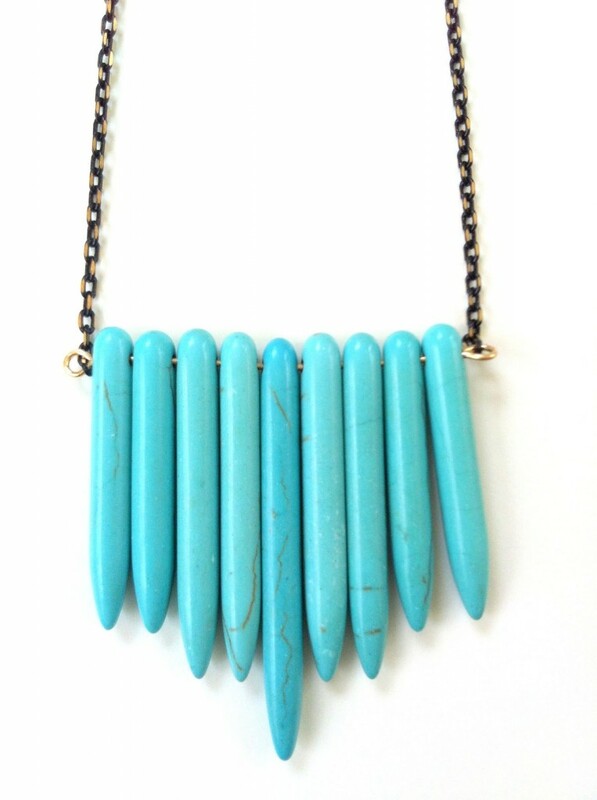 I am in love with turquoise right now! Done all the steps and Loving this necklace. Especially with all your style inspirations! I did all the steps, thank you! I never win anything but heres wishin! Completed all the steps ! :) Thanks!! I entered and hope I win! So cute! I've liked && followed! I really want this necklace! I hope I get it. done!! Idk how to get the thing to stop saying unknown but my name is Kylie Smith! All liked and followed! I've loved seeing your necklace appear in multiple posts. It always looks great and adds such a nice touch to your outfits! Fingers crossed I win! Did all of those!! Love how you styled the necklace! Really hoping to win this one! I am a proud follower of all! :) Love the necklace! It's one of my favorite colors. Done and done! :) Aca-mazing necklace. ;) Thanks Robyn! Following your blog, both on facebook & liked both on fb. seriously looove the company! So afordable too! Step 4- Here I Am...Check! Thanks so much for a great giveaway! I'm a new follower and am so tickled that I discovered you! Yay! I thought I had commented already...so glad I checked!! Love this necklace!! Hi, I used to check all new updates and blogs in instagram regularly. I think I mostly visit yours. Keep on rocking dudes.